1. Link CTQs to design features: To be able to design a product/process, the CTQs must be converted into design features. Like, how a single VOC may lead to one or more CTQ, a single CTQ can also lead to one or more design component(s). The role of a product/process expert is very critical in this activity. It is also advisable to arrive at the design features simultaneously when VoCs are being converted into CTQs. This will help in saving the time and effort spent by the team. Another option is to revisit (or) update the VoCs when design components are being listed down. This will help in preventing “Not so important nowadays” design items and keep track with the latest business requirements, thus giving the competitive edge. 2. Determine the importance level of the design features: After preparing the list of all design features that the product/process should have, order/prioritize all features that cannot be compromised at all and the one’s which can be given secondary preference. Design features related to safety of the product are the ones that should never be compromised. For example, an automobile manufacturer should put i) Responsiveness of Brake system as one of the primary/top priority requirements. Sometimes, it is possible that the VoCs may not bring this out (These are all unsaid/ implied needs). That is why, apart from VoC, VoB and VoE are also captured which will look at all the facets of the product and process. Quality function Deployment, otherwise called as House of Quality is a very important and useful tool. The tool has a table/matrix with 2 axes. The rows of the table are listed with the product requirements/CTQs. The columns are listed with the design features. The row column interaction is used to mark the relationship of each CTQ with the Design feature. A legend that represents how strong/how weak the relationship is used for this purpose. (For Eg: 1- Low 3- Medium 5- High). A triangle shaped roof is created at the top of the table. The cells/matrix of this triangle is populated with the correlation between the design features itself. (A same legend/scale is employed for this too). The relative importance of all the CTQs are, also populated along with the CTQs. 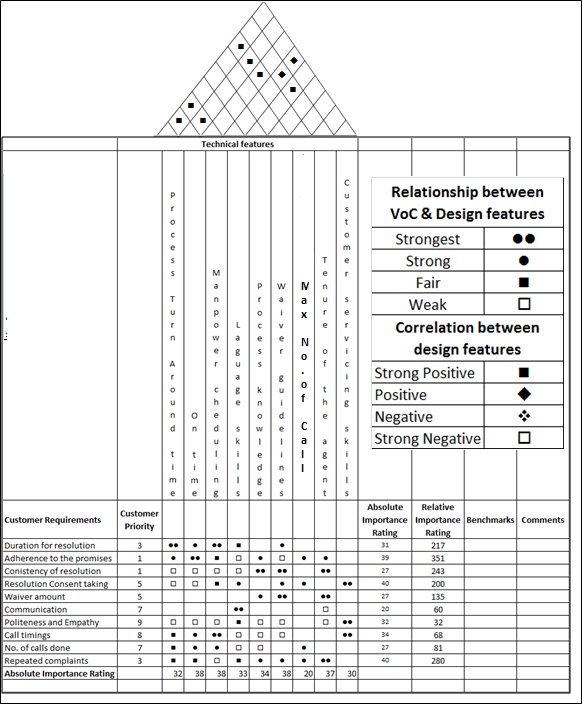 With the help of the relative importance and the relationship value of each cell, the relative importance and overall importance of all the design features are worked out at the bottom of the relationship matrix. 3. Fix Targets for the CTQs: The next activity is setting the target for the metrics. It is necessary that the targets are set at levels that cater/exceed the requirements of the customer. A well-defined metric with an easily achievable target or a target lower than customer specification is of no use as the expectations of the customer will not be met with such levels of performance. It is also advisable to benchmark the targets with those of competitors, similar processes and similar internal divisions. 4. Develop design concepts, Analyze and choose the best design: After arriving at the prioritized list of design features, the project team should list down a few probable design concepts. The process experts and the R&D team should be made involved in this process. It is necessary to brainstorm and list down the best possible design. Being innovative and creative will help the organization to remain competitive. iTRIZ (Russian terminology expanding as “Theory of inventive problem solving” in English) is a problem solving approach. According to this approach, problems are similar across industries and countries and appear as unsolvable. But a similar problem would have been solved somewhere in some other company/industry. So, convert your specific problem to a generic problem, which already has a generic solution. Customize and apply this generic solution to your problem. iTRIZ has a consolidated list of problems and their solutions readily available. This will reduce the time spent in R&D and experimenting on a huge list of possible options. Another important tool is the Six Thinking Hats. Six Thinking Hats is a decision evaluation tool that considers different aspects for evaluating a product or solution. Each aspect for evaluation is assigned a color. The team has to evaluate the idea /product wearing each color hat. By doing this, the team will be able to identify all the Pros and Cons of the product/solution. Information & Data: (White) – (Neutral) Evaluating the options based on the factual information available and its source. Emotions (Red) – (Feelings & Intuition) Evaluating the options based on the first judgment/emotions attached with the option without looking at the reasons and justification. Discernment (Black) – (Pessimistic): Being conservative and evaluating the options based on logics and reasons to be only conservative. List down Cautions, Dangers, Problems and Faults. Optimistic Response (Yellow) – (Optimistic): Being optimistic and evaluating ideas based on their values & benefits. Creativity (Green) – (Creative Thinking): Evaluating the ideas with a free mind, and allowing creativity and imagination in the thought process to define the feasibility of ideas. Looking at all the possibilities and alternatives and to look for new ideas or concepts. Process (Blue) –Evaluation based on process control, and governed only by metrics and process behaviour. After considering a list of possible design options, the best design should be chosen for working out the detailed process. Among the list of these varied options, how does one identify the best design? What is the criterion for selecting a particular design as best over the others? Pugh Concept Selection or otherwise called as Pugh matrix helps us with this complex task. Pugh matrix is a quantitative technique used to rank the multi-dimensional options of an option set. It is frequently used in engineering for making design, to rank investment options, vendor options, and product options. The concepts of QFD, iTRIZ, Six thinking Hats, Pugh matrix etc are all topics, which are big enough to write a full article on each one of them separately. We have tried to introduce the basic concept and the context of using this in DMADV. Readers who want to use them are request to read the other contents for detailed knowledge on these topics.